Not too long ago I ran a couple of studies measuring the effectiveness of three-point shooting ability for point guards and small forwards. The general idea wouldn’t be complete without a look at the remaining three positions. The results for shooting guards are very similar to those of point guards. Not surprisingly, having a player at those positions with the ability to shoot accurately from long distance greatly improves the success of your offense. One thing that is different is the frequencies. As you can see above, not too many shooting guards shoot less than 30% on three-pointers. However, the frequencies for shooters above 40% aren’t too high, either. Up next are the power forwards. For this position, I had to alter the criteria a little bit. To ensure adequate sample sizes, I had to change the definition of great shooters to those above 38% on threes, and poor shooters to those below 28%. It’s a minor change, but it’s fair because of the relative lack of big men who can shoot well from the outside. 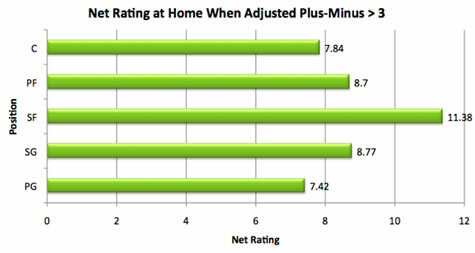 At home, it doesn’t seem to matter if your power forward can shoot. The four categories are essentially identical. On the road, it appears that your team gets a significant boost if your power forward can shoot threes at a higher rate than 28%. He doesn’t have to be spectacular in this area; he just needs to be adequate. Finally, let’s take a look at the centers. I had to make yet another change for this position. Even fewer centers can shoot three-pointers accurately, so I removed the cutoff points altogether. Instead, I classified centers as shooters or non-shooters. The difference was whether or not the player had a large amount of three-point attempts. Of course, by changing the criteria from accuracy to attempts, I changed the dynamic. However, given the scarcity of great-shooting centers, it was necessary. The center results may not be directly comparable to those of power forwards because of the different criteria, but they appear to be the inverse. On the road, it doesn’t matter if your center likes to shoot from the outside. At home, however, it is beneficial. Either way, the differences aren’t significant enough and the sample sizes too small for me to make a definitive statement. For point guards and shooting guards, it is beneficial for your offense to have players at those positions that can shoot threes effectively. For small forwards, it is best to have a player closer to average (between 30% and 40%). This may be the result of sharpshooting small forwards being specialists that are weak in other areas. For power forwards, it all depends on the location. At home, it doesn’t matter how well he shoots threes. On the road, it’s great if he can shoot them at 28% or higher. For centers, the answer remains unclear. There simply aren’t enough great shooting centers to reach a reasonable conclusion. It appears the two positions you don’t want to be weak at are center and small forward. On the other end of the spectrum, it appears you can manage a lot better with a bad point guard. Of course, it’s best to have as many good players as possible, so ideally you don’t have to “deal with” anything. At home, weak players at the guard position don’t appear to be particularly disastrous. 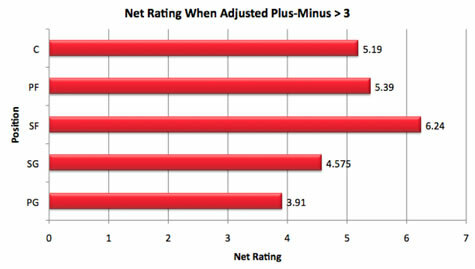 In fact, lineups featuring a point guard with an Adjusted Plus-Minus below -3 still on average tend to be better than their opponent. On the road, it hurts much more to have a weak guard, especially a 2-guard. Regardless of location, center and small forward are two positions where you can’t have a struggling player. Just like I did with my last study, I’m going to look at two potential hidden issues. The first is sample size. There appears to be an adequate amount of bad players at each position to make this study valid. 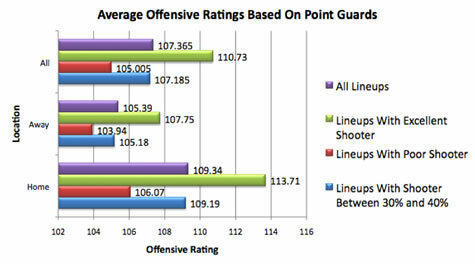 Interestingly, there are more bad players at point guard than at any other position. Originally I would have guessed centers would be the weakest. The next step is to calculate the average Adjusted Plus-Minus for each position among those that qualify. For example, if there are 20 point guards with an Adjusted Plus-Minus of -3.01, that position will look not as important because the players in the study really aren’t that horrible in the first place. What do the numbers say? With the exception of small forwards and possibly power forwards, the numbers appear to be pretty even across the board. This further supports the evidence that having a weakness at small forward is a major problem. Even though the small forwards in this study weren’t as bad as the other positions, they still had a more negative effect than any other position besides center. Finally, I’d like to relate this back to my original study. 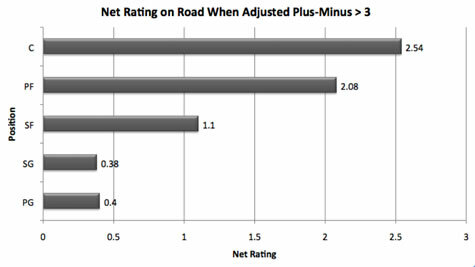 As you may recall, I suggested that small forwards and centers (especially on the road) are often the most important players to a team’s success. Today’s results support that assertion. Not only does having good players at these positions greatly improve your team, but having weak players at these positions worsens your team. On the other hand, point guards appear to be much less important. Both good and bad ones have less of an impact. Like I said in the original article, these studies are by no means the final authority. I only looked at two potential complications, and in reality there could be many more. Further studies should isolate the positions further and perhaps explain in more detail why exactly certain positions appear to be more important than others. I would also like to look at the results of previous years, which is something I may get into soon. The small forward position is one of the most critical positions in basketball. In most cases, the other four positions have specific responsibilities that don’t change a whole lot from team to team. However, the roles of small forwards are varied. Some teams use them as scorers, others as ball-handlers, others as defenders, etc. The goal of this study today is to determine the importance of three-point shooting ability in small forwards. 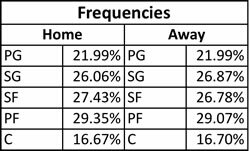 27.01% of home lineups feature a small forward shooting better than 40% on threes, and 21.22% feature one shooting less than 30%. On the road, those numbers are 26.56% and 21.62%, respectively. The results are a bit surprising. 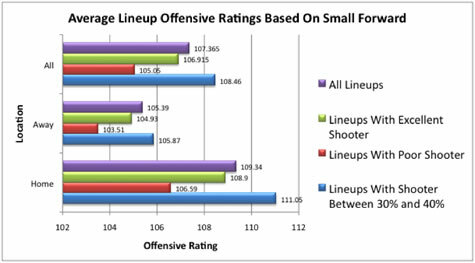 Least surprising is the fact that if your small forward is a liability from long range, your offense tends to suffer. Clearly there is some benefit to being able to spread the floor. What is surprising is the fact that lineups featuring a sharpshooter at the small forward position also tend to be worse (although only slightly). Perhaps this reflects the fact that three-point specialists are often limited in other areas. It appears the solution is to have a small forward who shoots somewhere between 30% and 40%. Again, this isn’t because missing shots is in some way beneficial. 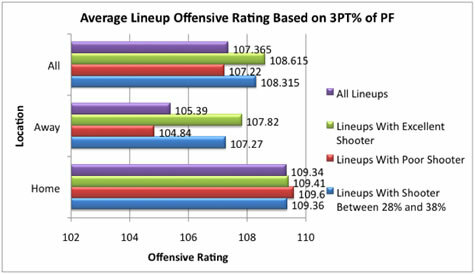 It’s most likely because the best shooters are the most likely to have the biggest weaknesses in other areas. I don’t want to generalize too much, though, and there could be a number of hidden explanations for this. For now, I’ll present the data and let you draw your own conclusions. It appears as though the ability of your team’s point guard to shoot the three well is very important. Overall, the difference is more than four points per 100 possessions. Similarly, if your point guard struggles with his outside shot, your offense will struggle. Is there a method for rating head coaches in the NBA? Perhaps just as important, should we even bother? Some have said that coaches are all essentially equal, while others refute those claims. Today will be the start of my first attempt at evaluating head coaches using statistics. The rating system will assume coaches can have an impact on a team’s success in three ways: improving offense, improving defense, and increasing the effort level of players (As a side note: there are obviously many more than three ways a coach can impact a team, but these three appear to be the broadest and easiest to quantify). In actuality, increased effort would be evident in offensive and defensive performance, but I have decided to separate it into its own category. I have done this because out of the three categories, effort level may be the one that is the easiest to attribute to coaching, as opposed to the talent of the players. Effort and hustle are extremely important for an NBA team, and perhaps they’ve become underrated. While talent is necessary to be successful, it is quite easy to notice the difference in effort levels between dominant and terrible teams. Part of this comes from the innate personalities of various players. Some just make their living by working harder than their opponent. But coaches can also have an impact, and today I will reveal which coaches appear to do the best job. To come up with a rating, I will use three statistics. 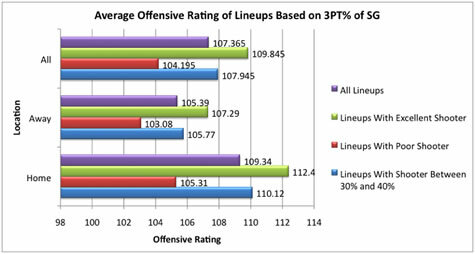 The first is the sum of a team’s offensive and defensive rebounding percentages. Rebounding is the result of effort as much as anything. The second is the amount of offensive fouls a team draws. Not every player will stand in the paint and take a charge. The third stat is fouls committed during loose balls. While committing fouls is never a good thing, it makes sense that teams that hustle more and go for more loose balls will inevitably commit more fouls in the process. I have examined the data and the teams that are generally considered to play with the most effort do in fact commit more loose ball fouls on average. 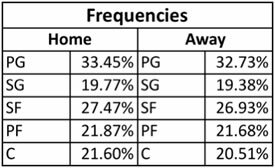 Offensive fouls drawn and loose ball fouls are then adjusted for pace. Once I have the three statistics, I calculate a team’s z-score in each category. I combine the three z-scores and multiply by 10 to come up with a team’s effort rating. As a result, an effort rating of 0 is average and scores generally range from -50 to 50. There are a couple of things to keep in mind when looking at the data. Like any simple study, it has some limitations. Teams with good height are more likely to be good rebounding teams, regardless of how much effort they give. Also, the data size of just seven seasons is relatively small. That means that coaches who lasted just one or two seasons could have effort ratings that are greatly overrated or underrated. It also means that coaches (such as Pat Riley) that got stuck on a few bad teams during the sample period will not look too great. And finally, don’t forget that in the end, it’s the players who actually produce on the court. The next steps are to estimate coaches’ impacts on offense and defense. That will be coming in the future. Mullens has a lot of physical gifts. He’s large enough to be a legitimate center in the NBA. To go along with this size, he has solid athleticism and quickness. This allows him to be a great finisher at the rim. Unfortunately, Mullens never really put it together at Ohio State. His production was inconsistent, to put it nicely. Had he been able to come straight out of high school, he may have been a top five pick. After one disappointing year in college, he’s just hoping to be taken in the first round. If nothing else, Mullens will be a pretty decent rebounder because he’s big and athletic. However, his offensive game is so raw that he won’t be much of a scorer. In fact, he’ll likely get less easy finishes in the NBA because of smarter defenders. Besides the rebounds, there is very little to praise in that box score. This is to be expected, though. Mullens had a poor season and I doubt anyone would state otherwise. However, he was just a freshman, and whichever team takes him knows they’ll be selecting a risky project. I started this article by saying that Mullens has a number of physical gifts. Those are real. The question is whether or not he turns those gifts into actual production in the NBA. Based on a small sample size, BSPS doesn’t think he will. Today I will be projecting the NBA stats of Austin Daye of the Gonzaga Bulldogs using my Box Score Prediction System. Daye has not hired an agent as of May 30 so he still retains the right to withdraw from the draft. If he chooses to stay, he will probably be selected some time in the first round. Daye is a unique prospect because of the wide range of skills he possesses despite measuring in at 6’10. He’s got a great shot from the outside but also possesses the athleticism to drive the ball to the basket. In addition, he’s a good ball-handler for his size. Finally, he’s a solid rebounder and shot blocker. Despite his shot-blocking skills, scouts have questioned Daye’s defense. Defense is half of the game, after all, so that is an area he must work on. However, that might not even be his biggest weakness at this point. Daye has a very wiry frame and if he doesn’t bulk up considerably he will not be able to bang down low with the strong big men of the NBA. The box score above looks good but not great, but I think there’s some hidden positives. Even though 15.41 points per 36 minutes isn’t a ton, BSPS thinks Daye will score in an efficient manner. His good three-point shooting and knack for drawing fouls will boost his true shot percentage. All Daye needs to do is become more aggressive and put those skills to good use. If he can do that, he can be a fantastic scorer. Being more aggressive would serve Daye well in a lot of other areas. Based on his size and athleticism, he should be able to pull down more than 7.18 boards per 36 minutes. It would also boost his assist and block numbers. Daye must control this aggressiveness, though. If that foul rate jumps any higher he won’t get enough minutes on the floor to make an impact. Like many of the prospects in this year’s draft, Daye is far from a sure thing. However, he has the size and skills to be a great player. A simple change of his playing mentality might do the trick. As the number of teams still in contention for the 2009 NBA championship dwindles down, it’s important to note not only the strengths of each team but also the weaknesses. All it takes is one major hole for another team to exploit and make you pay. We’ve seen this happen countless times in the past. So what is each remaining team’s biggest weakness? When you’re talking about a team as good as the Cavs, it’s really hard to find any weaknesses. They’re pretty much good at every statistical category. If I could nitpick and find one flaw, it would have to be their bench depth. With Anderson Varejao now starting, the only bench player they have with a PER over 14 is Joe Smith. Varejao, Big Z, LeBron, Mo Williams, and Delonte West are all great. After them, there is a bit of decline in terms of talent. But I should repeat: this isn’t a huge problem. It’s just the best I can do. In the regular season, the Celtics were the second best defensive team in the league and a strong sixth on offense. This balance allowed them to stay dominant despite Kevin Garnett’s injury. However, there’s been one area they’ve struggled in mightily all year: offensive turnovers. In fact, on a per-possession basis, Boston was the third worst team in the league at taking care of the ball. Who are the biggest culprits? Kendrick Perkins, Stephon Marbury, Tony Allen, and Leon Powe, to name a few. For a team as good as the Magic, it’s a surprise that they rank towards the bottom of the NBA in the two statistics I mentioned above. I’m especially surprised that a team with Dwight Howard can be so poor (third worst in the league) at collecting offensive boards. If you investigate closer, you can see why. The Magic’s two centers, Howard and Marcin Gortat, do a pretty good job of crashing the boards. But Orlando also starts Rashard Lewis at power forward, and he has an offensive rebound rate well below average for his position. One of the great things about the Hawks is that they’re so versatile. Despite playing without a true center, they generally have good size and athleticism. Thanks to having Josh Smith at the power forward spot, they can run with the best of them. Unfortunately, you can’t run unless you grab the rebound first, something the Hawks struggle at (although they did just fine against Miami). In the regular season, Atlanta’s defensive rebound percentage was seventh worst in the NBA. 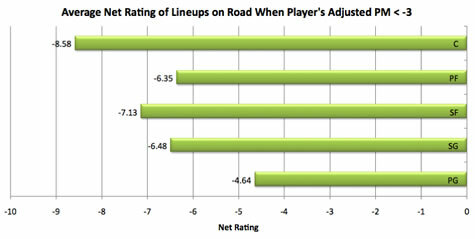 Derek Fisher is a solid vet who generally makes smart plays, but in terms of production he’s been lacking. His PER of 12.1 shows how in many games he is quite a non-factor. Thankfully his solid defense often makes up for this weakness. Behind him on the depth chart, it doesn’t get much better. Jordan Farmar has had plenty of ups and downs with the Lakers, and this season certainly qualifies as a down. His PER of 9.9 is very low for a rotation player on a championship contender. He shoots inefficiently and turns the ball over too much. The Lakers must be careful: the Rockets have two good point guards in Aaron Brooks and Kyle Lowry. Brooks has already shown what he can do. It’s no surprise the Lakers have started to resort to Shannon Brown and Sasha Vujacic. 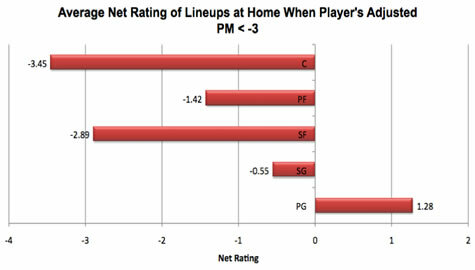 Like the Celtics, one potentially fatal flaw for the Nuggets is their inability to take care of the ball. Denver’s turnover rate is sixth highest in the NBA. It’s not a shocking statistic, considering the fast and sometimes wild pace they play at. 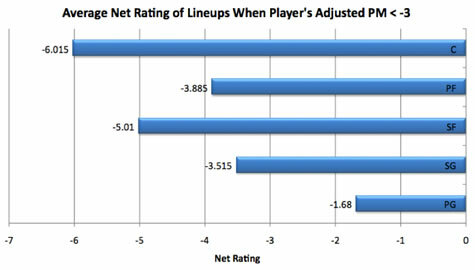 However, it is a bit surprising considering that their floor general is Chauncey Billups, a very steady player. The Nuggets with the highest turnover rates include Anthony Carter, Chris Andersen, Nene, and Dahntay Jones. As always, the Rockets are a stellar defensive squad. Their defensive rating ranks fourth in the NBA and they have defensive studs such as Ron Artest and Shane Battier on their roster. In terms of holding the opponent to a low field goal percentage, gathering rebounds, and not fouling, they are great. However, along with this steadfast approach comes a conservative attitude. Guys like Shane Battier won’t gamble for a steal; they’ll stay in front of their man and force a tough shot. In a way, this weakness may end up being one of their greatest strengths. In the 2006 Finals, there was a great deal of talk about the free throw discrepancy between the Heat and the Mavericks. It is indeed true that Dwyane Wade spent a ton of time at the foul line (although partly thanks to Dallas’s willingness to foul Shaquille O’Neal and put Miami in the foul bonus early). However, it is also true that the Mavericks have never been a great team at earning free throw attempts. Three years later, it’s still an issue. Jason Terry, Josh Howard, and Jason Kidd, three guys who don’t make a living at the charity stripe, run much of their offense. Even the main man, Dirk Nowitzki, doesn’t get fouled a ton. It’s simply not Dallas’s style. Recently I explored the correlation between Euroleague and NBA stats. My next step has been to incorporate Euroleague stats into my Box Score Prediction System. In the next few weeks, I will include projections of European prospects to go along with my projections of college players. I have slightly less confidence about the Euro projections because the data is more unreliable, but the projections will still be useful. All Euroleague stats were obtained from www.keyhoops.com. NBA stats were obtained from www.basketball-reference.com. Welcome to Nichols and Dimes, formerly known as Basketball-Statistics.com. My name is Jon Nichols and I have been performing statistical research on the NBA since 2006. For the newest research, go to Articles. For my original statistics such as Composite Score and PAC, go to Stats. For the rest of my articles, click on Articles. If you’d like to contact me, send an e-mail to jn42887@gmail.com.